I grew up in Scottsbluff, on the Platte River in the Nebraska Panhandle. I have been a published writer for over 40 years. My early works appeared in such magazines as The Reader's Digest, American History, Ford Times, Scouting, Good Housekeeping, Arizona Magazine, Wild West, Persimmon Hill,True West,The Denver Post's Empire Magazine. I find my interest drawn to the individual's story. What happens to them? How do they respond? Does the experience strengthen them? Or break them? In my latest book, I chose to write about a traumatic time I experienced in person. I remember vividly how life changed when Pearl Harbor plunged the nation into World War II. Scottsbluff soon had a B-17 bomber training base and a Prisoner of War camp just outside of town. Paratroopers were training 60 miles north in Alliance. Fort Robinson, not far east of Alliance, began training the K-9 Corps. Sidney, to the south, became an ordinance depot. The Panhandle and all of Nebraska, was fully involved in fighting the war. Every state was the same. One day our teen-aged sons made me realize that whole generations were growing up with no knowledge of the immense effort it took for the US to defeat the Axis powers. It took the whole country, working together, each person giving their all, to save our democracy. I decided important, valuable history was being forgotten, and I wanted to do something about it. As I got into my research, I became interested in the effect war and the ever-present propaganda had on children of the time, and I also explored the aspects of forgiveness, granted or denied. My research led to interviews with people who had been adults during the war. Combining what I learned through research with personal knowledge, I sought to recreate the early hears of that struggle, when the United States was on the edge of losing to the Axis powers. 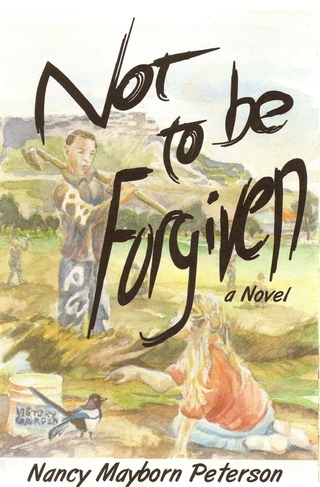 Not to be Forgive, a Novel,relates how the war impacted Hiram's Spring, Nebraska, and forever scarred the lives of Sis Greggory, her soldier-brother, Danny, and Horst, a German prisoner of war. Always, it is individual people and their reactions when they face a challenging situation that hold my fascination. I have written of the last moments of Lt. Caspar Collins as he faced Crazy Horse on the Platte Bridge. Of smoke drifting from ruined Cheyenne lodges after their final, futile battle at Summit Springs on the Colorado plains. Of Nebraska homesteader Luna Kellie's grief and desperation as she buried her second baby. These stories appeared in my first book, People of the Moonshell, a history of the Platte River. Going farther afield, I did a two-volume history of the Missouri River. I joined Edward Drinker Cope, clinging to a Montana cliff as he uncovered the first fossil of a triceratops. With a steamboat captain, I've "grass-hoppered" my boat over sandbars to find the maddeningly elusive river channel. And I joined a young Hidatsa girl, guarding the corn crop in her youth, and later giving birth in a tipi by the Missouri. Over the years, I've found myself drawn more and more toward native peoples. I've tried to understand their feelings as they were systematically driven from their homes. These interests produced my book Walking in Two Worlds, released by Caxton Press. Subtitled Mixed-Blood Indian Women Seeking Their Path, it tells the stories of 11 women of various tribes, most born of Indian mothers and white fathers. Snatched away to Eastern schools, where they were stripped of their native culture and trained for the white world, they had to discover who they were and what they could do with their lives. What they accomplished with those lives, each in her own way, I found amazing and inspiring and I wanted to write their stories. I am one of those caught in the current. It's been a great ride!